The Pilot sits pretty as Honda’s largest SUV. Indeed, it’s safe to say that it now holds the enviable title of a Can’t-go-wrong crossover option. Not only does it tick all the right boxes as a three-row crossover, but it also appeals to families. This is understandably the case since it boasts a well-built interior, is super roomy, has a strong engine and handles excellently on the road. Given these qualities, the Honda Pilot seems to bridge the gap between minivans and crossovers. If you love driving through highways, you’ll enjoy the soft drive offered by the Honda Pilot. The same can also be said when navigating through curvy sections of the road. This is largely because of the crisp and precise steering control. That said, off-roading isn’t the Pilot’s forte. Still, the impressive 7.3 inches ground clearance, optional all-wheel-drive system, and 4 drive modes offered allows the Honda Pilot to maneuver through sandy beaches and dirt roads with ease. Straight from the manufacturer, the Honda Pilot comes with a full suite of active safety technology. The features included are adaptive cruise control, active lane control, and automatic emergency braking. Having highlighted these features, you can tell just why the Pilot is loved by families. Want to see it in action? Check out this video! It’s worth noting that to get the best out of the Honda Pilot, you need to cop tires that complement the vehicle. The best tires for Honda Pilot will provide great traction on both dry and wet surfaces. You need to also be on the lookout for tires that provide excellent traction in snow and cold weather. Other qualities to look for include longevity, durability, comfort and quietness levels of the tires. In a bid to make your search for the best tires for Honda Pilot easier, we’ve compiled a top 5 list for your review. Importantly, we made a point to include various tires since not everyone resides in the same weather locale. This classification was also made with the full knowledge that there are different types of drivers out there. So, regardless of where you live and your driving style, our handy guide will prove helpful. Read on! Admittedly, crossovers are very popular because they usually come with all-wheel-drive all-terrain functionality. While that’s the case, there are really that many drivers that usually veer off-road when driving the Honda Pilot. As mentioned earlier, the Honda Pilot has great features that allow it to tackle light terrain. Still, it’s not the very best off-road vehicle out there. This means that when you’re selecting the best tires for Honda Pilot, you need to query yourself whether you’re willing to take the Pilot off the road often. If you’re sure you’ll mostly be driving on-road, then, you can ignore all-terrain or specialized terrain tires. Having driven the Honda Pilot on a number of occasions, I’m inclined to say that it’s mainly a family car. As such, you should have that in mind whenever you are out tire-shopping. All-season tires are some of the best tires for the Honda Pilot. This is largely due to the fact that they offer excellent grip and traction, even on wet surfaces and snowy conditions. On the other hand, touring tires are highly rated thanks to the high comfort levels offered. The smooth, quiet car rides make for comfortable driving, even on long stretches. Of the two, touring tires are more durable meaning that they have quite a lifetime before needing replacement. Having referenced the family element in the Honda Pilot, touring tires are probably your best bet. This is because you’ll have the freedom to go on lengthy family drives without a hassle. Should you discover that touring tires are a tad bit pricey, you can always opt for all-season tires. These tires provide impressive traction on both dry and wet surfaces. The only downside is they are slightly louder and less comfy than touring tires. If you reside in a region where you experience heavy snowing during winter or the rain is quite frequent, all-weather tires are the way to go. These tires perform considerably better than all-season tires in both snowy and wet conditions. They also fair quite well in dry weather conditions. The soft rubber in winter tires makes them perfect for handling freezing temperatures. Snow tires are essentially just variants of winter tires. The key difference is that they have deeper lying grooves and a more aggressive tread pattern which makes them ideal for extremely bad weather. 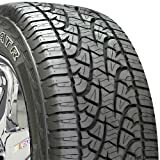 Since the soft rubber constituent in snow and winter tires degrades faster in warm conditions, these tires can’t be used in warmer climates or during summer time. High-performance summer tires are great in regions that experience hot summers and mild winters. With them in tow, you can easily tackle dry and hot pavements. Impressively, the work considerably better in rainy conditions than all-weather and all-season tires. As a word of caution though, avoid using these tires in cold conditions or during winter time. This tire offers excellent performance on all types of road conditions, even snow. Thanks to its wondrous construction, the LX20 is right at home when you’re feeling adventurous and willing to explore some off-road sites with light terrain. This touring all-season tire is a safe bet for you if you’re aiming for a smooth, quiet ride with the family on long highway trips. The tire also has great traction in snow, wet, and dry surfaces. You’ll also enjoy the great handling when cruising through cityscapes and driving through corners. The engineers behind the LX20 cast their magic with the incorporation of the +Silane additives and Tg-F polymers during manufacture. These two elements are responsible for the enhanced contact offered by the tires while on the road. They also make the tires much more durable. Very impressive on dry roads, almost akin to what you would expect with high-performance tires. Regarded as one of the most versatile tires in the market. Has 4 circumferential grooves laid out symmetrically and additional traction grooves to enhance grip and traction even in snowy and wet surfaces. Impressive 70,000-mile tread warranty. A trait that’s quite special in the market. If you’ve gone with the AWD option with the Honda Pilot, then, this is the ideal tire for you. The Pirelli Scorpion Verde All Season Plus is fantastically built. The Italy-produced tires are made from quality rubber that ensure the tires have great traction and handling on the road. 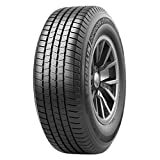 In addition, this property ensures that the tires offer low-rolling resistance when driving. Remarkably, the rubber constituent in the tires can bring your MPG numbers closer home to what front-wheel-drive models register. This is made possible thanks to the presence of the light weigh silica-enhanced tread compound and lower susceptibility to rolling. Given this eco-friendly element, it’s little wonder why the tire is aptly named the Verde- Italian for green. Excellent traction and grip in wet and snowy conditions. This is due to the asymmetric tread design. Has a uniform contact patch for enhanced grip in dry conditions and sport-like handling around corners. The patch also ensures that the tire wears out evenly. This is a very durable tire because of the two high-tensile steel belts and the polyester cord body. The longitudinal sipes and high-density lateral sipes make the tires perfect for winter driving and improve stability even when you’re speeding. You can choose from a wide range of sizes. Quality 65,000-mile tread warranty. This means that it’s possible to go 3-4 seasons before you even start thinking about changing tires. Evertread compound helps this tire last longer in severe conditions. This tire offers shorter wet stopping distances and better snow traction. MaxTouch Construction helps this tire save you fuel over the life of the tire. Among the best tires for Honda Pilot, the Michelin Defender LTX M/S is highly rated. Built to provide optimum performance for drivers of SUVs, crossovers, and trucks, this tire can do it all. Not only can it withstand any type of weather, but it can also handle any road. The tire has great traction on both wet and dry pavements. Fascinatingly, the tire performs better in the snow any other all-season tire out there. You can enjoy quiet and comfortable rides when driving these Michelin tires, even on long distance travels. There’s no chance you’ll hear the tread pattern noise often heard on uneven pavements. Features a great Evertread compound and high-density Active Sipes which are helpful in harsh weather conditions. Has lateral grooves which boost the tires water drainage in wet conditions. The MaxTouch construction crucially helps in distributing effects of wear and tear evenly. An important trait which helps with braking, handling, and durability. This high-performance summer model is made to offer great traction, excellent grip, and fantastic comfort levels. Since the tires are specifically made for SUVs and sport trucks, the UHP guarantees performance on all-season traction and grip on various road surfaces. The tires are made from a 2nd generation silica tread compound that is beautifully paired up with a directional tread compound to guarantee great handling, braking, and grip in all-weather driving. As a precaution, you should avoid driving on these tires when winter rolls around. While the General Grabber UHP has great traction on dry surfaces, it’s not the ideal fit for snowy conditions. The General Grabber UHP is fitted with aggressive V-shaped sporty directional treads that have exceptional center-to-shoulder grooves. The treads are made to ensure that the tires always have great road contact even when you are driving on snowy and wet roads. Constitutionally, the elements making up the Grabber UHP make it the perfect mix of touring and all-terrain tires. With a flat belt contour, shallow slots, varying groove angle depth, and an impressive Advanced Sound Reduction Technology, the combination guarantees that you enjoy smooth and quiet rides. Available in 16”-24” diameters. This makes it capable of fitting in a number of different models and wheel applications. General offers a limited warranty on the UHP. You are eligible for cover within a year or use or the first 2/32-inch wear in overall tire uniformity. 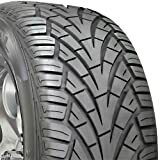 The Pirelli Scorpion ATR is a hybrid all-terrain tire made from a silica-enhanced compound which makes it durable and sturdy. The tires have large, stable tread blocks explicitly designed to boost the directional stability and response to steering actions. The Pirelli tires have independent tread blocks with awesome small sipes. These grooves are designed to boost the off-road traction when driving in icy weather or on loose surfaces. The tires have polyester cords on the interior section boosts the strength of the sidewalls. This has the overall effect of improving the ride quality since you’re less likely to experience damage and punctures. Perfectly blends on-road comfort with rugged performance. Here’s to hoping our top 5 list of the best tires for Honda Pilot will help come to your aid as you shop for tires. Given the choice to pick one from the list, we’d go with the Continental CrossContact LX20 EcoPlus as the best tire of the lot. Why? It has the essence of a truly world-class tire thanks to the guaranteed quiet car rides and the super tough construction which translates to durability. Having said that, it’s important for you to choose the tires based on your driving style and the weather conditions of your locale. That way, the tires you pick will be able to fit your needs and you won’t strain much. As a parting shot, you should also strive to regularly rotate the tires during maintenance. This is a good practice since it keeps the tires in the best condition. Safe driving!